We are excited to announce our partnership with Oregon State University (OSU) College of Pharmacy that has made it possible to open a full-service pharmacy at our Benton location in Corvallis. 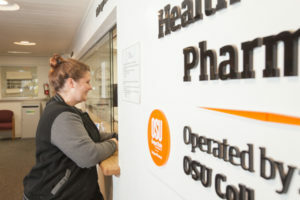 OSU staffs and manages our pharmacy services. The pharmacy is available to all patients of the Health Center who receive primary care, mental health, and dental services at any of our locations. The pharmacy is only able to fill medications prescribed by Community Health Center of Benton and Linn Counties providers. The only exception is prescriptions from physicians who treat our patients as a result of a referral from one of our providers. The pharmacy offers a discount program for medications. Pharmacy staff are familiar with pharmaceutical company programs that may make medications available for free for eligible individuals. Pharmacists offer patient education on how to manage chronic conditions, such as diabetes, asthma, and hypertension. They work with patients with complex medication needs to assure the best results. Pharmacists work closely with Health Center patients who have chronic pain. The goal is to help find effective, safe ways to manage pain and improve quality of life.